Reading an inspirational book by your favourite pool. I plan to share some of the books I like here in my blog. When I was younger, (extra) reading sometimes seems like a clandestine hobby. Now, I’m not afraid to share the affairs I had with those alluring books. I’m really glad how pieces of information I have gathered form a complete worldview of all the wonders and problems in the world. What I’ve learned changed or challenged me. How powerful books can be! 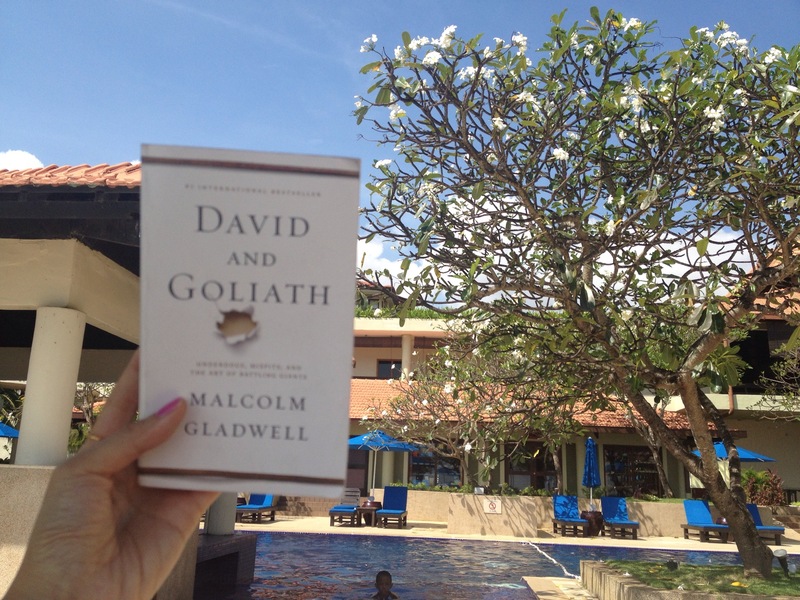 My latest favorite is ‘David and Goliath’ by Malcolm Gladwell. It’s about why and how underdogs and misfits triumph over more powerful force. It’s so consoling to know that great effort can win inherent abilities and difficulties can be desirable. p.s: Last May at the same resort, I had the pleasure to hangout with Divyaa, a bright ten year old girl. I heard that she’s an avid reader too and would buy four to five books everytime she visits the bookstore with her father. I think she would enjoy ‘David and Goliath’ too. Divyaa, If you’re reading this, maybe you can get this book next!